Cole Horton - Author & Professional Geek: Did a German Immigrant and Lucas Family Neighbor Inspire the Name of Han Solo? Did a German Immigrant and Lucas Family Neighbor Inspire the Name of Han Solo? Did a German immigrant living down the street from young George Lucas inspire the name of one of Star Wars most iconic heroes? History geeks and genealogy researchers have been busy since the National Archives release the complete 1940 census online yesterday. The online record, three years in the making, gives a sneak peek into the lives of everyday Americans in 1940 and life during the great depression. In my ongoing quest to bring together "a long time ago and a galaxy far, far away", I took a peek at the census records for Modesto, CA - hometown of George Lucas and his family. The influence this suburban California town had on the filmmaker is well know; Lucas' 1973 film American Graffiti was based on his experience cruising and drag racing in the small town in the early sixties. 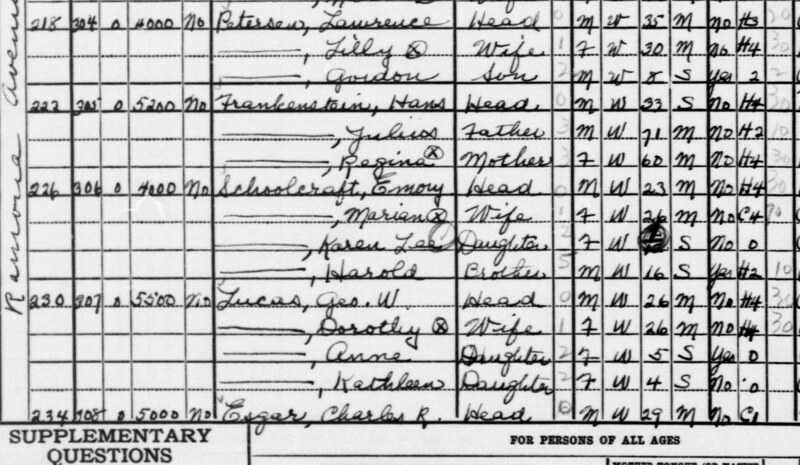 While the 1940 census predates the filmmaker (George Jr. would not be born until 1944), is does give us a snapshot of his family in their home on Ramona Avenue. As expected, George W. Lucas Sr. is listed along with his wife Dorothy and their two daughters. The elder Lucas owned a retail stationary store that the younger George was intended to take over when his father retired. As a business owner, Lucas worked all 52 weeks in 1939 and took home no salary (although he does indicate other income). 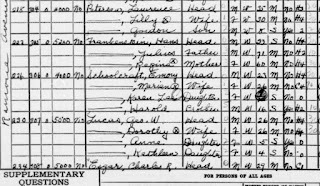 In addition to a snapshot of the Lucas family, the 1940 Census reveals the family's neighbors on Ramona Ave. in Modesto. Next door was Emory Schoolcraft, a local embalmer. Two doors down was a German-speaking immigrant from the Free City of Danzig, 33 year old Hans Frankenstein. Frankenstein, a Jewish immigrant, likely fled Nazi Germany after Adolf Hitler rose to power. In America, he met his future wife Hilda Frankenstein (her maiden name was also Frankenstein), but is still listed in the 1940 census as living with his parents. He supported his family working as a junk dealer and like Lucas, reported $0 in salary and wages. The Frankensteins continued to live near the Lucas family well into George's childhood. George Lucas was childhood friends with George Frankenstein, so perhaps it was this German immigrant who inspired the name of the galaxy's most famous scoundrel. According to Star Wars Locations, the Lucas family lived at their Ramona Avenue residence until 1957 when they moved to a new home outside of town. The younger Frankenstein later worked for George Sr. while in high school at the office supply firm, L.M. Morris. To see the entire 1940 Census record for Ramona Avenue, visit the Modesto enumeration district listing complete with maps and original hand-written records. While there, take some time to look up your family or discover the people who lived at your residence in 1940.